I'm sorting through and cleaning up some of the materials I picked up and C2E2 a week and a bit ago, and in addition to the comics and graphic novels and prints, I wound up with a number of business cards. I found a few others from previous shows that never got filed away for some reason and, in looking at them all at once, had a few thoughts. I have one here that lists the artist's name, his website, and a quote about geniuses. On the back is his logo. Problem 1: muddy coloring. He's got three color bands (magenta, purple, and dark blue) with simple black text on top of it. But the black text on the dark blue background is almost illegible. Granted, it's only this quote, but you really don't know if it's useful information or not until you strain your eyes trying to read it. Problem 2: No direct contact. I can understand not wanting to include a phone number or address, but there's no email either. The only way you can contact him on the card. Yes, it's got his website and there's a contact form there. There are far too many steps to get in touch with him. Problem 3: No art. Despite citing himself as an artist on the card, there's no art. I have no clue what his style might be without going to the site. A website is indeed a critical component of doing business with anyone these days, and you should keep contact info there as well as art samples (if you're an artist), but a business card is about relaying contact information, not coercing me into an online quest. This next card does address all of the above problems. One side of the card is devoted to her information (name, email, DeviantArt & Tumblr URLs) and the flip side is devoted to her comic with good sample art and the URL of the comic itself. I don't know that there's anything wrong here per se, although I do wonder about listing three websites on one card. And that two of them aren't her own domain gives me pause. Also, if you DO have your own domain, why would you provide a Gmail address instead of one based off your domain? I'd think that would be better marketing, as you're reinforcing the comics' URL. This next one isn't actually a card, but a quarter of a sheet of paper. Name, email, website, and art sample. But it's clearly a piece of card stock ran through a copier and chopped into quarters. There are some people who try to do something fancy with the specific dimensions of their card so it stands out from all the others that are the more standard 3.5" x 2" layout, and I can respect that, but a quarter of a sheet of paper seems lazy. We're all so familiar with the size of typing paper that a quarter of it is almost immediately recognizable as such. So it looks like you dashed these off at your hotel on your way out the door this morning. Which, I suppose, is better than nothing if you accidentally left your real business cards at home, but it's not a great look. I will highlight the winner of business cards from what I picked up was Ryan Fisher. The front of his card has his name, email, website, and an art sample -- specifically, the art from the cover of his latest book. 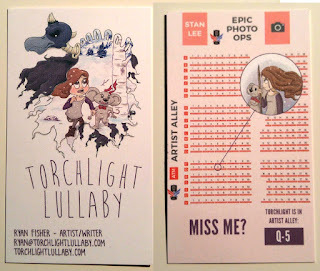 The back of his card is a floorplan of C2E2's Artist Alley with his location highlighted; he had this batch of cards specifically printed up for this show. That's obviously an additional expense and wouldn't make sense for every show he might do, but for something as large as C2E2, that's not a bad idea. It's easy to get lost and/or turned around in Artist Alley, even if you just run to the end of the aisle to use the ATM (conveniently also noted on his map) so he's making sure you can find your way back to his table if you had any interest in his material. The last I checked, I think Vistaprint was doing 500 cards for $25 so it's not an unwieldy cost and if that meant he sold just one more book, he'd at least break even on them. That's certainly not a comprehensive list of DOs and DON'Ts but I noticed these, like I said, with some of the cards I recently picked up. Just some things to consider when putting together materials for your next show. I get what you mean. I was at a local con recently and had gathered quite a number of business cards from young artists. Most of them only had their names and a facebook page. Not even a website, just a facebook page. No contact numbers or even an e-mail address. Some don't even have their names on their cards, just their online aliases or their deviantart handles.